This Skinny Margarita is perfect when you’re craving that fresh mix of limes and tequila but trying to save on calories! There are just 98 calories per drink! 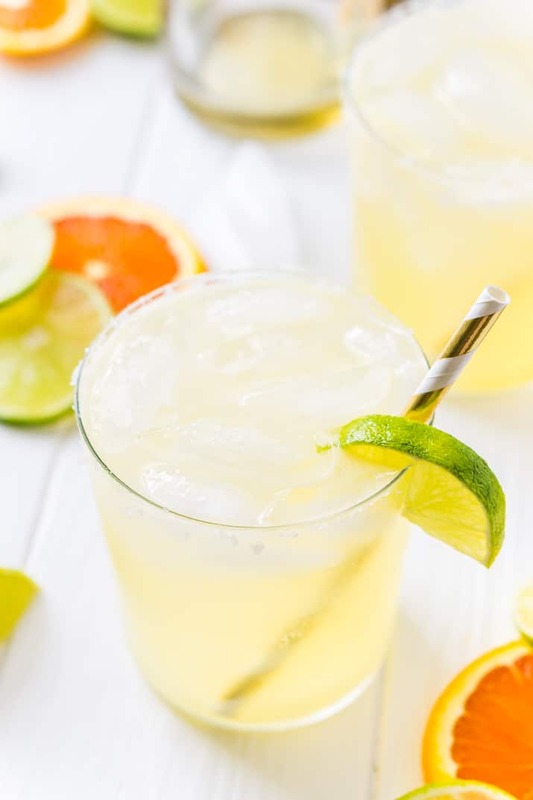 It’s finally starting to feel like spring (at least here in New England), and what better way to celebrate than with some freshly made Skinny Margaritas! The lighter version of this classic cocktail is delicious, easy to make, and it won’t throw you off your summer diet. Plus, let’s not forget that everyone’s favorite Margarita-slurping holiday is coming up: Cinco de Mayo! If you ever needed an excuse to sip this tequila-based beverage, this is it! So what makes Skinny Margaritas so “skinny”? A few simple swap-outs from the traditional recipe slash calories so you can have all the fun without the guilt. Without any sweetener, this drink comes in at just 98 calories! This low-calorie version trades Cointreau or Triple Sec for fresh orange juice, removing the liqueur eliminates a ton of calories. There are approximately 95 calories per ounce of orange liqueur and only 14 per ounce of freshly squeezed orange juice. It calls for a salted rim instead of sugar. I also add a little less tequila than traditional Margarita recipes. Normally you would add about 1.5 ounces of tequila to a margarita, this recipe calls for just 1 ounce. Tequila has about 64 calories per ounce, so feel free to make the drink stronger at your own discretion. Some people prefer a bit of sweeter margarita, I often add a splash of simple syrup to mine, but that can make the calories skyrocket. For this recipe, I would recommend using agave which would lend nicely to the agave-based tequila. Honey can also make a nice substitute if you don’t have agave in hand. 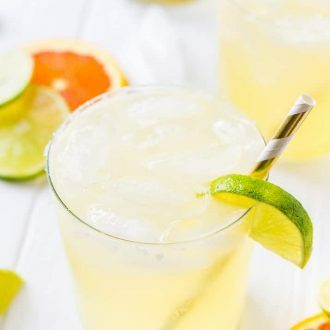 I like adding a bit of fizz to my skinny margaritas to keep things interesting, adding a touch of club soda is calorie free and makes for a fun little cocktail! 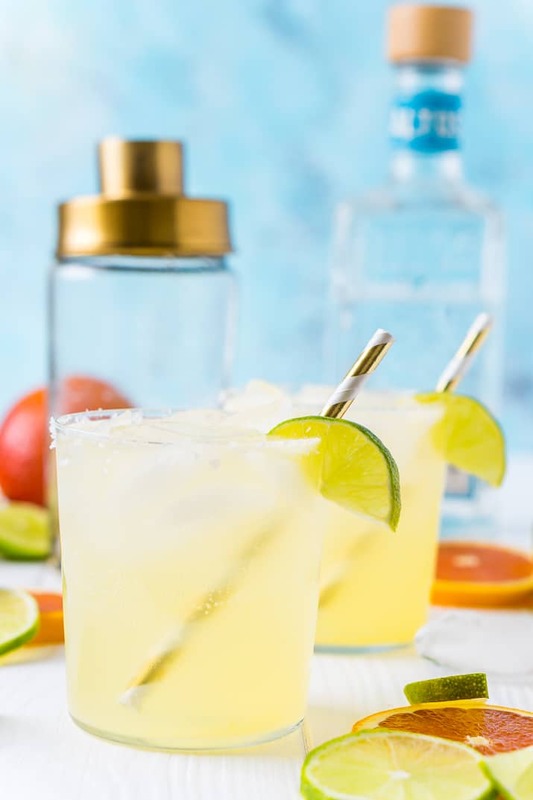 You only need five ingredients to whip up a batch of these Skinny Margaritas. Mix up some freshly squeezed lime and orange juices, a few glugs of tequila, and a touch of honey or agave if desired, then pour into salt-rimmed rocks glasses. With as simple lime wedge garnish, you’ll be ready to get the fiesta started – bonus points for fancy straws! These Skinny Margaritas may be light in calories, but they certainly don’t skimp on taste! I love that they highlight the fruity flavors of the season because nothing says warm weather is upon us like a bright pop of citrus! 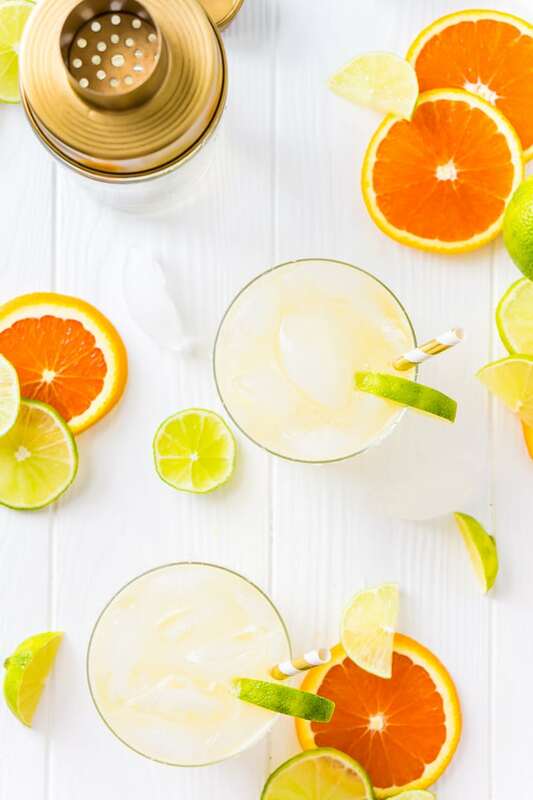 These sweet-tart mixed drinks are so refreshing, you’ll find yourself craving them on mild spring evenings and balmy summer nights. After all, nothing gets the good times going like a round of Margaritas at a backyard barbecue! And as I mentioned earlier, this simple Skinny Margarita recipe is the perfect drink to enjoy while ringing in Cinco de Mayo! Whether you’re hosting a get-together or you and the family are feeling festive at home, these flavorful cocktails won’t disappoint. Try sipping Skinny Margaritas alongside a bowl of rich, authentic Slow Cooker Posole or some tropical Easy Fish Tacos. And since these drinks are easy on the waistline, you won’t have to feel bad about having two! Pin this Margarita Recipe for Later! 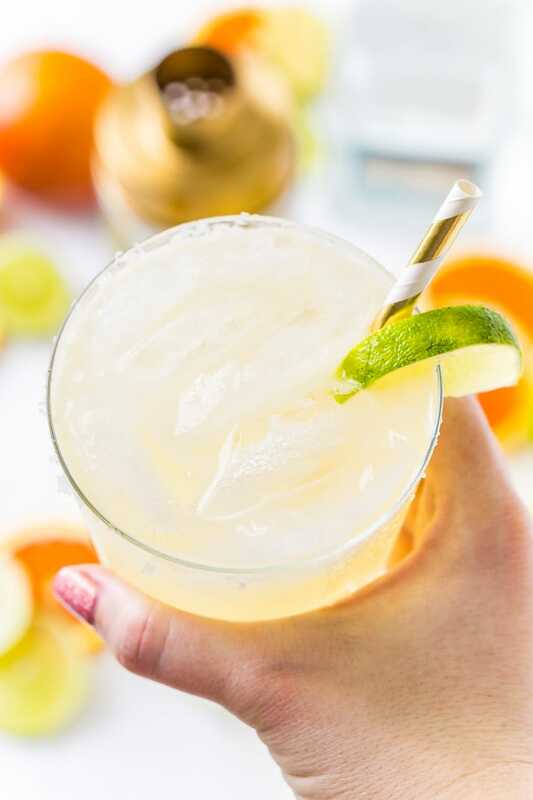 This Skinny Margarita is perfect when you're craving that fresh mix of limes and tequila but trying to save on calories! There are just 98 calories per drink! Run a lime wedge around the edge of two glasses and then roll in salt. Add lime juice, orange juice, tequila, and sweetener if using in a cocktail shaker and shake to combine. Pour over ice and enjoy. Top off with club soda if desired. Omit the tequila and replace with club soda. Now this is my kind of margarita! I really love the addition of Orange juice too! Thank you for this fabulous recipe! Yum! I love using the fresh juices instead of a mix!